Robinson in THE WAR OF THE WORLDS. Ann Robinson was born on May 1, 1935, in Hollywood, California. Sometimes Ann Robinson is credited as Ann Robin. Trying to get her jump in the entertainment field, Ann Robinson had several uncredited roles including CITY BENEATH THE SEA, I WANT YOU, A LIFE OF HER OWN, THE DAMNED DON'T CRY and CALLAWAY WENT THATAWAY. In 1953, Ann Robinson got her big break, co-starring with Gene Barry, Les Tremayne and Robert Cornthwaite, in George Pal's THE WAR OF THE WORLDS, playing Sylvia Van Buren. She got two more chances to portray Sylvia: in the TV series WAR OF THE WORLDS: THE SECOND INVASION, and again in 2005, in THE NAKED MONSTER. 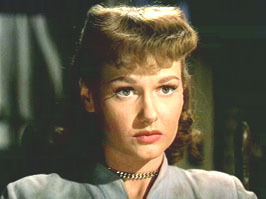 Ann Robinson in THE WAR OF THE WORLDS (1953).